Lee Lauderback is the President, CEO, and chief flight instructor of UAT. Lee has more than 20,000 flight hours in all types of aircraft, including more than 8,700 hours in the Mustang. He is a certified single- and multi-engine flight and ground instructor and holds an Airline Transport Pilot certification as well as instrument, helicopter and glider ratings. Because of his expertise and vast experience in both corporate and private aviation, he has earned the distinction of being an FAA Examiner. Lee is often called to flight test various vintage planes, helicopters and Turbojets before they are accepted. 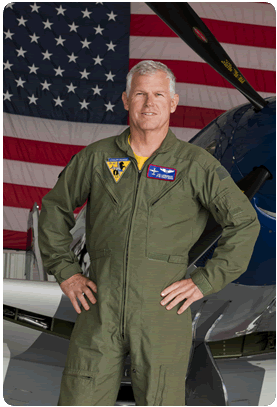 Lee’s expansive aviation knowledge and flying experience includes the F-15 Eagle, F-16 Viper, and F/A-18 Hornet. He has also test flown the Hawker Beechcraft T-6 Texan II. Lee has more than 2,000 hours in sailplanes and has competed in many soaring contests. He has also held several sailplane records. Lee started flying sailplanes at age 14 and launched his corporate aviation career immediately after college as the chief pilot and director of flight operations for Arnold Palmer. Lee flew the noted professional golfer, philanthropist and businessman for 17 years in a Learjet, a MD500E helicopter and several different models of Citation jets. Currently, Lee performs his signature solo Mustang routine at air shows or in the USAF Heritage Flight program as the civilian lead. The USAF Heritage Flight program showcases historic WWII military aircraft as well as current USAF military aircraft in a unique formation flight. Lee has also instructed students at the Navy Test Pilot School in Patuxent River, Maryland. Lee is a graduate of Embry-Riddle Aeronautical University in Daytona Beach and holds a degree in Aeronautical Science and Business Management. He is also a Master Falconer and if he’s not in the skies himself, he is probably flying his hawks and falcons.